Reminder: the views expressed on my personal blog do not necessarily represent the views of the PTUA. 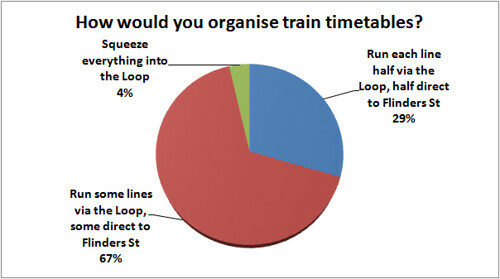 I don’t know how the general public would react if asked the question about how the Loop should run. (Maybe someone should.) But I suspect increasingly people are aware of how “metro” rail systems overseas run: primarily point-to-point, minimising merges, junctions and all that messy stuff to pack as many trains along the track as possible, and accepting that some people will have to change to get where they’re going, or walk a little further to their destination. My personal view is in line with the majority here: they should be moving towards some lines running via the Loop, some lines direct. Having consistent patterns means it is predictable to passengers, and you can fit more trains onto the tracks without causing hiccups as they merge into the Loop tunnels. As long as trains are frequent enough, and the interchange facilities are good enough — including signage (both static and electronic) — it’s not an insurmountable issue to change trains, if the payback is there with more reliable, more frequent, less crowded trains. Melbourne needs to do a lot better in these aspects, of course. There are limits to what you can do in the real world. One would be rightly cautious for instance about shifting all peak-hour Frankston trains out of the Loop. (At present in peak, the stopping trains run via the Loop, the expresses run direct to Flinders Street.) The sheer demand from people trying to pack onto the remaining Loop trains at Richmond means it’s not something that can be done without causing much bigger problems. Stand by for another post, specifically about Loop direction. I guess reliability is the most important factor, i.e. whatever actually works.